Los Angeles, CA (KSNV News3LV) -- American Airlines flight 2472 had to make an emergency landing due to mechanical problems at LAX Monday evening. The Boeing 757-200, traveling from San Diego to Dallas-Fort Worth, declared an emergency due to a flap issue. The plane landed without incident in Runway 25 and taxied to the gate. “The aircraft, a Boeing 757 with 182 passengers and a crew of six, landed safely and taxied to the gate. Our maintenance team is currently evaluating the aircraft." Textron Inc said on Monday it plans to develop a new business jet, the Cessna Citation Hemisphere, adding a competitor to the field of large, long-range private aircraft that have captured increasing sales in recent years. The Hemisphere will complete a three-jet Cessna Citation lineup that includes the smaller Citation Latitude and super mid-sized Longitude. Textron said it chose Honeywell Aerospace's HTF7700L turbofan to power the Longitude jet, replacing the Silvercrest engine by French maker Snecma, a unit of Safran SA. Textron Aviation Chief Executive Scott Ernest would not say if the company was likely to also pick Honeywell to supply the Hemisphere's engines, adding that Textron is "continuing to look" for the right engine fit. 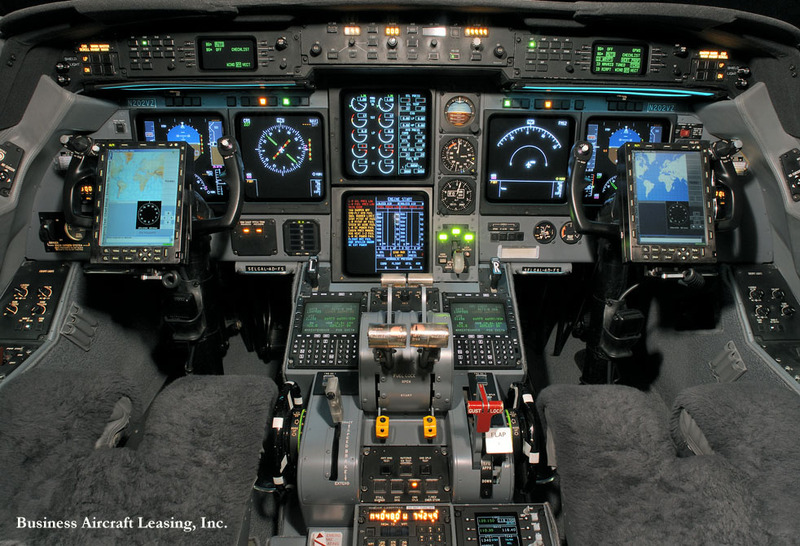 Honeywell said it was also picked to supply the Longitude's auxiliary power unit and some cockpit technology. Textron said the Citation Hemisphere would have a range of 4,500 nautical miles, and the first flight is expected in 2019. At an area airport, Textron showed a mock-up of the Hemisphere fuselage, with a 102-inch diameter that would be "the widest cabin in its class." The seating configuration is being worked on with customers. The Cessna announcement came as Textron said it would develop a single-engine turboprop plane in conjunction with a new General Electric engine, marking two new aircraft launched at the National Business Aviation Association conference here this week, and suggests growing confidence in a market rebound despite slow sales expected next year. Nigeria’s major carrier, Arik Air, has denied that its Accra-Banjul flight on Sunday, which had the national U-23 team on board, lost a tire and engine and endangered the lives of the passengers. In a statement signed by the airline spokesman, Adebanji Ola, the operator lamented that Nigerians painted grossly erroneous pictures of the flight. “The aircraft that was conveying the team to Banjul had a stopover in Accra, Ghana. On ground Accra, the captain, while on routine walk around the aircraft as part of the airline’s safety procedure, noticed that one of the tires had a low pressure (not flat). Instead of keeping the team in Accra longer than necessary, we had to deploy another aircraft that was on a night-stop in Accra to take the team to Banjul. “The captain of this aircraft was airborne when he had to make an air return due to a gear pin in-situ. However, our standard operating procedure required the aircraft to be re-certified by our maintenance partner, Lufthansa Technik before it could continue with the flight to Banjul,” the airline said. Arik said it had to fly in Lufthansa engineers from Lagos to change the low pressure wheel on the original operating aircraft for it to fly the team and other passengers to Banjul, adding that the other aircraft were also examined and released back to service. “The safety of passengers is paramount in our operations and we will not compromise this for anything. The Nigeria Football Federation has already issued a statement to correct the erroneous impression that the team nearly had an air crash,” Arik Air also said. “Family Feud” host and media do-it-all Steve Harvey is being sued by a Nashville company that says Harvey owes about $200,000 for custom alterations to a Gulfstream G-IVSP. The Tennessean reports. Business Aircraft Leasing Inc. says in court papers that Harvey agreed to pay it $400,000 for customization of a Gulfstream G-IVSP that he “orally promised” to lease for $97,000 a month. 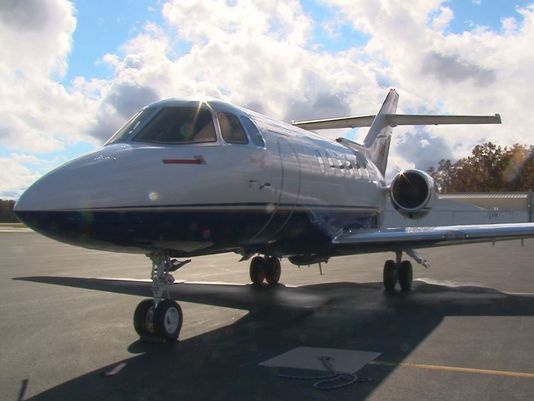 The Nashville company hired a Florida company, Private Sky Aviation, to do the work. That included altering the plane from 16 to 14 seats and customizing the seat and interior design. Harvey paid about half of that money before saying he did not want to lease the aircraft, according to the federal lawsuit. Business Aircraft Leasing is suing Harvey and One World Aviation — a company Harvey owns or operates, according to court paperwork — for the remaining $205,040 or more. The company asks that sum to be determined at trial. The aircraft renovated for Harvey is listed on the company's website as available for lease. See it here. The contract dispute case was filed in U.S. District Court in Nashville on Wednesday. It names Harvey and One World Aviation as defendants. 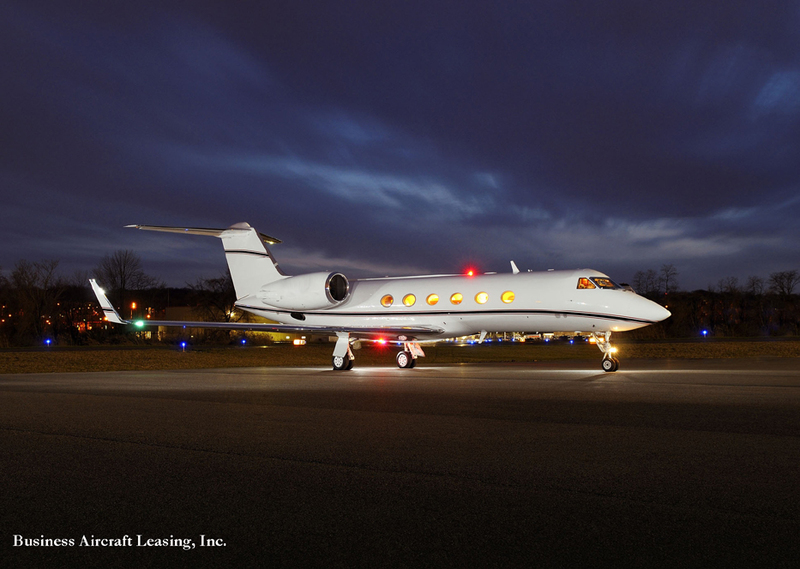 Business Aircraft Leasing is a Nashville-based broker that leases and sells private jets. Harvey and One World have not responded to the complaint. Harvey and his publicist, Trisha Miller, did not return email or phone requests from The Tennessean. Business Aircraft Leasing President Chuck Mulle and his attorney, Brian Meldrum of Stites & Harbison in Louisville, Ky., also did not return requests for comment. LEXINGTON, N.C. -- The pilot who made an emergency landing on Business 85 Monday afternoon will soon receive a bill in the mail. Pilot Cliff Evans said unknown engine trouble on his small airplane forced him to land on the highway. The plane was going about 65 miles per hour when he landed in a grassy median, then crossed two lanes of traffic before stopping on the shoulder. According to the North Carolina Department of Transportation, Evans will receive an invoice to cover the cost of assistance from the DOT. A department representative said the cost will include eight employees, six trucks, putting up advance warning signs and diverting traffic for four and a half hours. The representative said the bill could be up to $3,000. The NC DOT has had a long standing policy to bill people who destroy state property on state-maintained roads or require assistance from DOT workers. Did you know you could be billed if you get into an accident on a state-owned road? Hit a guard rail? Take out a highway sign or a light? Expect to get a bill to pay for it. The representative said motorist insurance usually covers the cost. The department said it tries to recover the cost it incurs from crashes. If you think that's bad, consider this. Some agencies nationwide are charging for much more. For example, in Sacramento, California, the Metro Fire Department charges a $275 first responder fee for every 911 EMS call. Some police departments even charge up to $100 to respond to and fill out traffic crash reports. In Indianapolis, local media reported a couple years ago that a married couple received a $28,000 bill after their house went up in flames. The fire department sent the itemized bill for labor and equipment, and included the water firefighters drank at the scene and refilling their oxygen tanks. As you can imagine, the idea is not very popular. "The people that receive these bills have either not payed them or said 'sorry, this is why I pay my taxes, why should I pay you a fee for something that should be considered to be a municipal service,'" said Steve Alldredge, of the National Association of Mutual Insurance Companies. There are dozens of municipalities nationwide that charge what's called accident response fees. Outside of the DOT, we haven't been able to find any in North Carolina that charge a fee like this. DAVIDSON, NC -- On Monday, a small airplane had to make an emergency landing on Business 85 near Lexington. 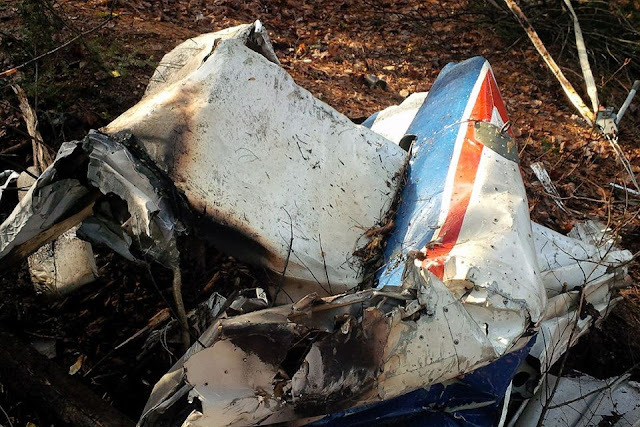 The pilot is not exactly sure what caused the engine trouble that forced him to land. Evans was on his way to Siler City from Dayton, Tennessee when the plane started having issues. So, he detoured to the Davidson County Airport. But, when he couldn't make it, he started looking for another safe place to land. “Lucky, I guess. I found the least busy road, on the opposite side was a lot of oncoming traffic," Evans said. The plane was going about 65 miles per hour when he landed in a grassy median, then crossed two lanes of traffic before stopping on the shoulder. 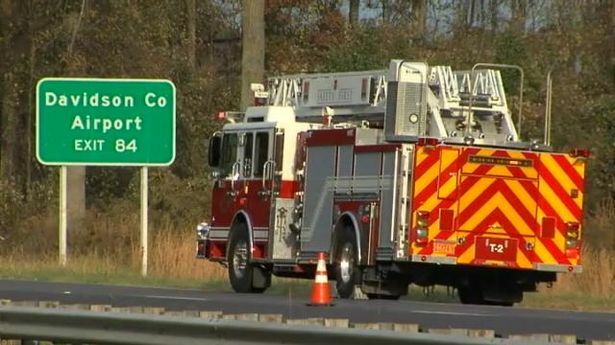 “First communication was that the plane had made an emergency landing on the highway and that there were no injuries and my first thought was, 'Man, we were very lucky,'” Lexington Fire Chief Phillip Hartley said. Hartley said this is the first time in nearly three decades at the fire department that he's seen something like this. The airplane made a safe landing, and there is no damage visible damage to the aircraft. Also, no one was injured in the incident including Evans, his two passengers or any drivers on the highway. “You don’t panic and a lot of people have a tendency to panic. It can become a bad situation real fast between power lines and cars and things like that," Evans said. Evans said he and his friends were flying to Siler City to pick up a vehicle. Instead, the Hummer ended up getting delivered to them on the side of the highway where they landed with the plane. Originally, crews tried to load the plane on the back of a tow truck, but when it wouldn't fit, they used the Hummer to tow it less than two miles to the airport. "It’s an experience. But you train for it, I mean, you train for it," Evans said. Evans plans to have the plane checked out Tuesday at the Davidson County Airport to make sure it's safe before he flies back to Tennessee. “From here you have to fly over the Smokies, a lot of mountains, nowhere to land," he said. Evans has been a pilot for four years and said he's never had anything like this happen. 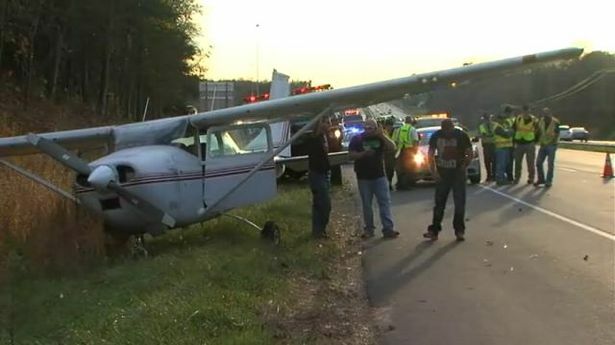 A pilot was forced to land his plane after in the middle of Interstate 85 in North Carolina Monday. The pilot made the emergency landing on I-85 in Davidson County after he lost power. 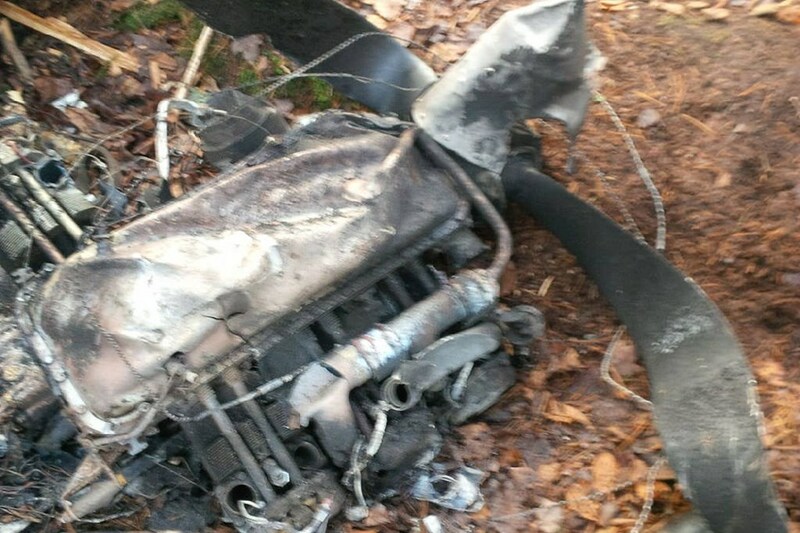 Investigators said the plane, which was coming from Tennessee, lost power just two miles away from its destination in Siler City. The pilot, Cliff Evans, tried guiding the plane onto the runway but couldn't make it, so he tried landing just off the highway -- all while avoiding power lines and a business park. "You can't panic,” Evans said. “You just gotta keep your mind on flying the plane. A lot of people panic and that's not a good thing." 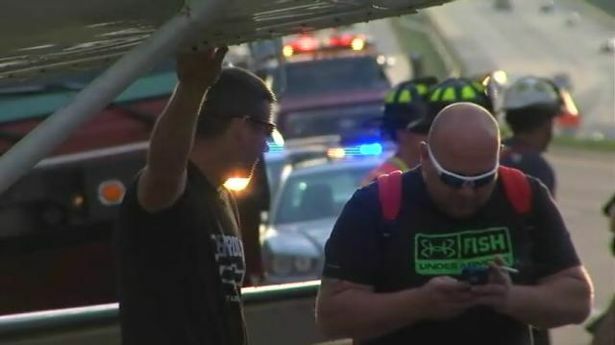 A tow truck couldn't move the plane off the highway so the driver of a passing Hummer volunteered to move the plane off the interstate. Investigators are trying to figure out what caused the power failure. 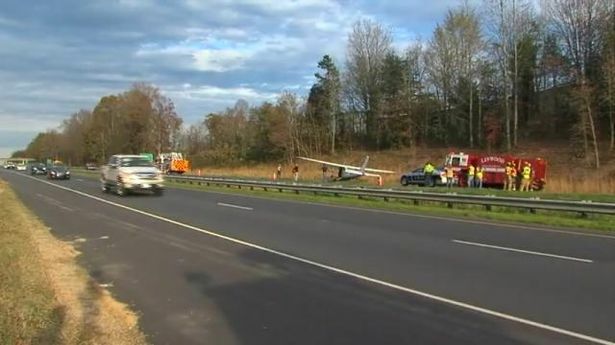 DAVIDSON COUNTY, N.C. — No one was injured after a small plane landed on a Davidson County highway Monday. The incident was reported around 3:15 p.m. on Business 85 near Hargrave Road, Interstate 85 and the Davidson County Airport. Three people were onboard the plane at the time of the landing. A lane of Bus. 85 was closed due to the incident. The Cessna 182L Skylane is registered to Cliff Evans of Dayton, Tenn., about 40 miles northeast of Chattanooga. Evans said he was flying from Dayton to Siler City when the plane started sputtering. Evans said he tried to land at the airport but used his pilot training to land on the freeway after realizing he couldn't make the airport. Evans said he's been a pilot for 4 years. Personnel of the police’s Special Branch and Criminal Investigation Branch, visited Tropic Air’s office in Ranchito Village, Corozal District, and made the discovery of a substantial amount of cannabis inside a Lala milk box. On Friday morning, November 13th, officers acting on tips received, spoke to the manager of that Tropic Air office and cut open the box in his presence, finding inside, some baby clothes and a parcel that was tightly wrapped in transparent plastic. The parcel was cut open and 486 grams of cannabis was found inside, which was labeled as “Found Property” since no owner could be linked to the box. United Airlines, by far the dominant player at Newark Airport, wants to purchase rights to control even more of the takeoff and landing slots, a move that would almost certainly lead to price increases. This isn't how a market economy is supposed to work. It seems more like the robber-baron days when John D. Rockefeller could use his monopoly power to set oil prices. The word "monopoly" is not ours; it is contained in a federal lawsuit that attempts to block this move. United, the suit notes, already controls 73 percent of the slots at the airport. It notes, too, that the average fare at Newark ($473) is significantly higher than the average at JFK Airport ($439) or LaGuardia ($410). A spokesman for United claimed that prices are higher because Newark has a higher share of business travelers, who tend to pay more. And he says that United would use the added slots to offer direct flights to new destinations, a boon to fliers. But at what point does United's position at Newark stifle legitimate competition? At what point would fliers from our side of the Hudson reluctantly accept higher fares to avoid the schlep to the New York airports through that nightmare traffic? When we ask United whether competition would be threatened if a single airline controlled 90 percent of the slots, or even 95 percent, they refused to answer, calling it a hypothetical question. True, that. And let's make sure it remains hypothetical. The only sure way to ensure that United is not gouging fliers is to protect what competition is left at the airport. The Department of Justice can see that, and so is stepping in to block this move. The Business Travel Coalition, an advocacy group for customers, agrees. And five smaller airlines that want a chance to compete at Newark recently wrote the U.S. Department of Transportation, saying their efforts to get slots have been turned down. Remember, too, that this move by United comes as the Justice Department conducts a wider investigation into "unlawful coordination" by four major airlines – United, American Airlines, Southwest Airlines and Delta Air Lines. The attempt to establish monopoly power at Newark is the least of it. If there is good reason to allow United to expand its reach at Newark, we've yet to hear it. Our hope is that federal government wins this one. A Qantas jet with 152 passengers and crew on board scraped its tail on the runway at Sydney airport during take-off last year after pilots incorrectly entered data into an iPad attached to the plane's computer. The mishap occurred on August 1, 2014 after the pilots had inputted data saying that the 737 aircraft was 10 tonnes lighter than it actually was, the Australian Transport Safety Bureau (ATSB) found. A flight attendant on the Sydney to Darwin flight who was seated at the rear of the plane during take-off reported hearing a "squeak: which led pilots to check whether the jet had scraped the tarmac. The aviators then contacted Qantas maintenance engineers and made the decision to fly onto Darwin after their instruments failed to detect any indication of a tail strike or damage to the aircraft. Once they made it to Darwin the pilots found paint damage which confirmed the plane had scraped the runway. However, despite the impact a cartridge containing the plane's tail strike sensor was intact, indicating the plane "only just contacted the ground during take-off", according to the ATSB. When the pilots checked the 737's performance figures on their iPad they discovered that the take-off eight was 10 tonnes lighter than the aircraft's 76.4 tonnes. The ATSB concluded the tail strike occurred because of two data entry errors in calculating the plane's take-off performance figures. 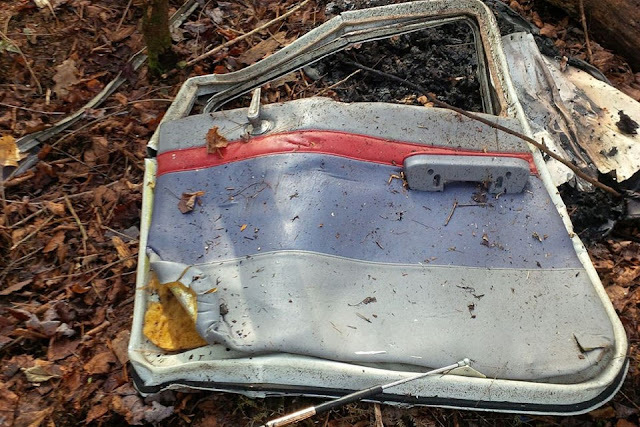 "This resulted in the take-off speeds and engine thrust setting calculated and used for the take-off being too low," the bureau said in the final report. "As a result, when the aircraft was rotated, it over pitched and contacted the runway." Qantas has responded to the mishap by making changes to pilots' pre-flight procedures. The ATSB said "Data input errors can occur irrespective of pilot experience, operator, aircraft type, location or take-off performance calculation method". "The application of correct operating data is a foundational and critical element of flight safety, but errors in the calculation, entry and checking of data are not uncommon," the ATSB said. 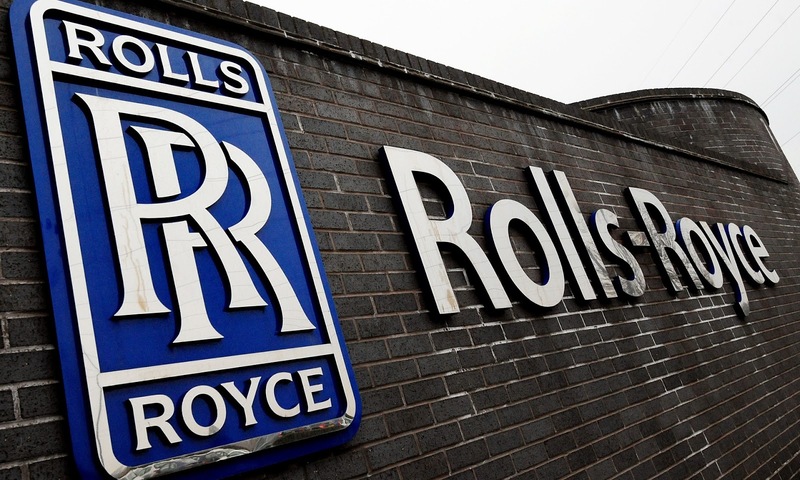 Rolls-Royce has called in a leading law firm to help it deal with bribery allegations and a serious fraud office (SFO) investigation. Slaughter and May has been brought in while the SFO investigates allegations of bribery and corruption at the FTSE 100 engineer. Rolls-Royce was initially accused of paying bribes to win contracts in China and Indonesia, but it has also been linked to the corruption scandal facing Brazil’s state-owned oil company, Petrobras, and the SFO has said it is looking into several of the UK company’s divisions. The news that Slaughter and May, one of the UK’s top five law firms, is working with Rolls-Royce underlines the seriousness with which the company is treating the investigation, launched in December 2013. Rolls-Royce hired the New York law firm Debevoise & Plimpton in 2012 to conduct an internal investigation after the SFO requested information from the company when a whistleblower made allegations about its conduct in China and Indonesia. This investigation led to Rolls-Royce handing further information to the SFO, which launched a formal inquiry into the company. It is understood Slaughter and May was initially hired by Rolls-Royce two years ago as its joint legal counsel, meaning it worked for the company on financial transactions. However, it is now also advising Rolls-Royce on the corruption allegations, with leading litigation partners drafted in, and is thought to be the company’s principal adviser. Slaughter and May has a history of helping major British companies deal with corruption allegations. It defended GlaxoSmithKline, Britain’s biggest pharmaceutical company, over an investigation into its conduct in Iraq during Saddam Hussein’s regime. The Slaughter and May partners Richard Swallow and Jonathan Clark are working with the engine maker on the investigations. Rolls-Royce, which makes engines for the Airbus A380 superjumbo, has said it is cooperating with the SFO and authorities in Brazil investigating Petrobras. The company is facing one of the biggest challenges in its history. As well as the SFO investigation, Rolls-Royce has issued four profit warnings in the last year and faces calls to be broken up. ValueAct, an activist investor, has built a 5.4% stake in the company and wants Rolls-Royce to sell off its marine division, badly affected by the decline in the oil price, to focus on producing engines for civil aeroplanes. Warren East, the new chief executive of Rolls-Royce, has rejected ValueAct’s calls and refused to offer the investor a seat on the board. East will outline his strategy for Rolls-Royce at an investor day next Tuesday. However, he gave a glimpse into his plans last week when he issued another profits warning and said the company needed to cut costs to be more agile. Rolls-Royce blamed its profit warning on falling demand for corporate jets in Brazil, China and south-east Asia, a decline in maintenance and servicing revenues from its engines for large planes, and energy industry customers being affected by the slump in the oil price. The Derby-based group now expects profit “headwinds” of £650m next year, more than double the £300m cut to profits identified earlier in the year. In response, East wants to reduce costs by up to £200m a year at the same time as improving decision-making, which will lead to Rolls-Royce cutting 2,000 senior manager jobs around the world. Rolls-Royce is struggling largely as a result of investing in wide-bodied aircraft such as the A380 at a time when demand is focused on narrow-bodied passenger plans. Rolls-Royce abandoned the narrow-bodied market in 2013 when it pulled out of a joint venture with its rival Pratt & Whitney so it could focus on wide-bodied aircraft and the next generation of single-aisle planes that should follow the Airbus A320neo and Boeing 737 Max. Analysts at Agency Partners said Rolls-Royce faces “existential risks”, including a decline in the use of its older engines – which will reduce the aftermarket sales that Rolls-Royce enjoys – and a general weakening in the aerospace market. The analysts added: “The last point is important, as the crisis to date has been largely specific to Rolls-Royce and has occurred against the background of unprecedented sustained strength in civil aerospace markets – overlaying a sector downturn on Rolls-Royce own crisis would make life yet more difficult. General Electric Co. said it is developing a new family of turboprop engines, taking aim at a market stronghold of rival Pratt & Whitney. 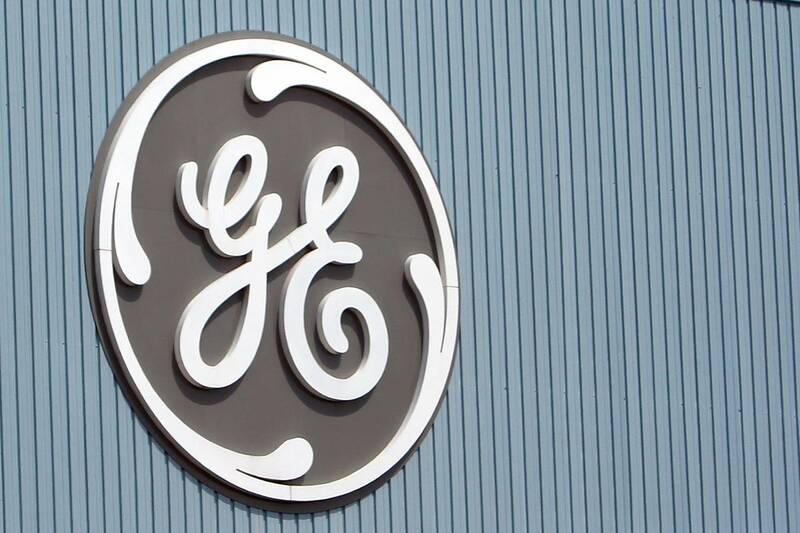 GE said Monday it had signed on with Textron Inc., maker of Cessna, Hawker and Beechcraft planes, to provide the power plant for a new single-engine plane it will launch toward the end of the decade. Textron accounts for more than half of all general aviation aircraft in use today, the company says. The announcement is GE’s boldest move to crack into a market that has been dominated for decades by Pratt & Whitney, a division of United Technologies Corp. Pratt has sold more than 50,000 engines for small planes like Cessnas used by general aviation pilots. On Monday, Pratt also announced a new variant of its PT6 engine that it said would boost power and efficiency from previous models. The PT6 is the dominant engine on general aviation aircraft, according to data from the General Aviation Manufacturers Association, a trade group. And Textron has been a major customer for Pratt’s PT6 engines, which it uses on brands like Cessna and Beechcraft. Those two brands shipped 221 airplanes equipped with Pratt engines last year, according to GAMA’s data, down from 240 the previous year. In a news release, Textron said it expected the new plane to outperform competitors in cost and performance. Nicholas Kanellias, general manager of general aviation programs for Pratt & Whitney Canada, which makes the PT6, said the company was continuing to improve and upgrade the engines, and would do so despite the new challenge from GE. GE is using some of the technology and strategy developed in its much larger commercial jet engine business as it prepares to more aggressively take on the turboprop market, said Brad Mottier, general manager of business and general aviation in GE’s engine business. The company will develop and test the new engine at a $400 million new turboprop center it is building in Europe. GE already builds turboprops at a factory in the Czech Republic and says the expanded center will support up to 1,000 jobs. The company says it will launch the first full test of the new engine in 2018. While general aviation engines spend far less time in the air than those on commercial airliners, they also require much more frequent overhaul and maintenance, Mr. Mottier said, offering the promise of a steady stream of service revenue. The new GE engine will feature computerized management of the engine and propulsion controls that will allow 20% greater fuel efficiency and 10% greater power than comparable models, Mr. Mottier said. Winning the deal with Textron to provide engines for its new aircraft was crucial to GE’s efforts, Mr. Mottier said. Unlike the commercial engine market, where there are only a few major airframers, the market for small aircraft is much more fragmented and diverse. “If you win Textron, you can justify a new program investment," he said. A memorial service will be held Tuesday in Tillsonburg for Jane and Phil Esseltine, who died in a Cessna 182H Skylane crash last week. 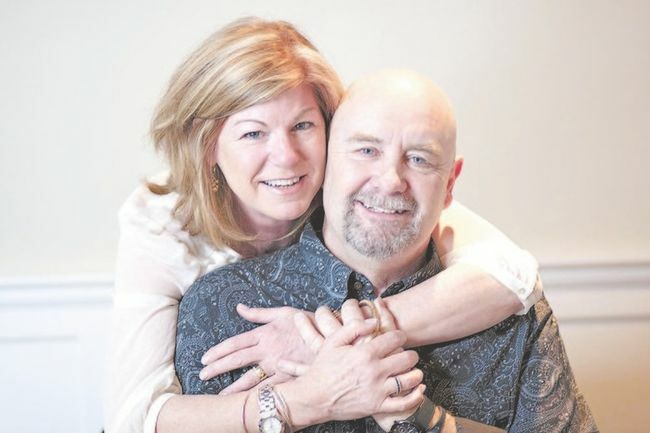 Jane and Phil Esseltine were more than just pillars of the community in Tillsonburg. The town and the couple’s family are expected to gather Tuesday at the Lions Auditorium for their memorial services after the couple was killed in a plane crash near Parry Sound a week ago. They had been at their Muskoka family cottage on Lake Isabella and had just taken off from the Parry Sound airport in their own small plane when it crashed Nov. 9. A driver on Highway 400 saw the crash and called 911. “They were incredible people. They were leaders in business, leaders in philanthropy and leaders in service to the community,” Quintyn said. The Esseltines owned and ran Agrospray, a farm chemical firm started by Jack Lanthier, Jane’s father, in London and that moved to Tillsonburg in the ’70s. “They were building on the success as owners of Agrospray,” Quintyn said. The fertilizer company grew to produce environmentally sound approaches to agriculture. Phil, 59, was president and chief executive; Jane, 55, was vice-president and chief administrator. Married for 34 years, the couple had a son, two daughters and two granddaughters. Tillsonburg held a special place in their hearts. Phil had deep roots in Tillsonburg. His mother was a longtime nurse at the local hospital and his late father had been mayor. Phil served as board chair of Tillsonburg Hydro, director and past president of the Tillsonburg Chamber of Commerce, a minor hockey coach and at Junior Achievement. Jane was vice-chair of the Tillsonburg District Memorial Hospital Foundation, a member of the Tillsonburg Multi-Service Centre and Junior Achievement. The family has asked that any donations in their memories be made to the hospital foundation. Six University Park Airport attendants are suing Penn State, claiming they were underpaid for the amount of hours they work a week. Penn State, in conjunction with the Centre County Airport Authority, owns and operates the airport, 2535 Fox Hill Rd., according to court documents. The attendants are arguing that, while they are required to work 42 to 42 ½ hours per week, Penn State only pays them for 40 hours, deducting 30 minutes of their meal time per shift, “even though [Plaintiffs] are working through their meal times,” according to the documents. The attendants are required to work five 8 ½ hour shifts per week or four 10 ½ shifts per week, but Penn State has not paid for the attendants’ meal time, associated overtime, since at least Nov. 13, 2012, according to the documents. The attendants are arguing under the Fair Labor Standards Act that they are due to their unpaid overtime as well as liquidated damages and attorney’s fees, according to the documents. NORFOLK, Va. (WAVY) — A woman was caught with a loaded handgun at Norfolk International Airport Monday morning. Officials say that Transportation Security Administration officers detected the handgun at a security checkpoint early Monday morning, just three days removed from an incident where a man was caught with a gun. The Rappahannock County woman was stopped by security officers with a .380 caliber handgun that was loaded with six rounds of ammunition — and one round that was in the chamber. Officers immediately contacted Norfolk Airport Authority Police, who confiscated the weapon and issued the woman a citation on a state weapons charge. The incident did not impact airport operations. This case marks the fifteenth time that TSA officers have detected a handgun at Norfolk International Airport this year — which is more than double the number that were detected in 2014. Weapons — including firearms, firearm parts and ammunition — are not permitted in carry-on bags, but can be transported in checked bags if they are unloaded, properly packed and declared to the airline. TSA has details on how to properly travel with a firearm posted on its web site here: http://www.tsa.gov/traveler-information/firearms-and-ammunition. December 30, 2013: A private airplane experienced a landing gear malfunction Monday night while touching down at Pensacola International Airport, causing officials to close the airport for about three minutes as well as close down the airport’s north to south runway for several hours, an airport official said. 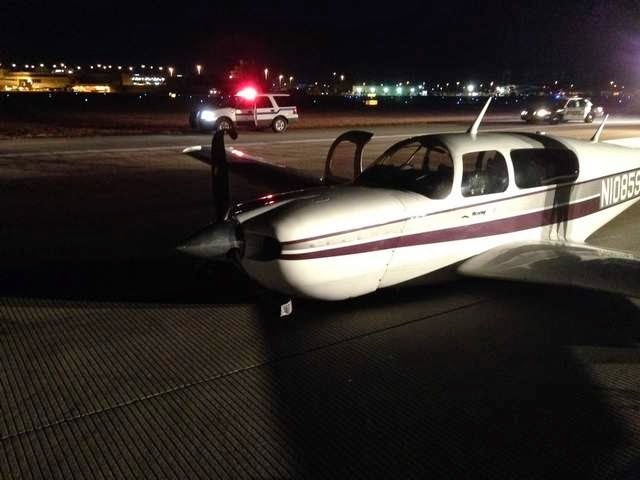 Pensacola International Airport Director Greg Donovan said that between 7:30 and 8 p.m. last night, the landing gear of a Mooney M20M TLS aircraft gave way as the airplane attempted to land. The pilot, the only one onboard the aircraft, was uninjured, Donovan said. The plane skidded partway down the runway on its belly, causing minor damage to the aircraft and no damage to the runway. Emergency responders were at the scene of the crash within minutes, and the airport was closed to air traffic for about three minutes while officials assessed the severity of the incident. Officials determined that runway 17, the north to south runway, would have to be temporarily closed with the aircraft was removed. The east to west runway remained open. The plane cleared from the runway at 11:22 p.m., Donovan said. He said it had been more than 10 months since a plane had landed at the airport with its gear up. The Mooney M20M TLS aircraft was traveling from Fort Lauderdale to Houston. 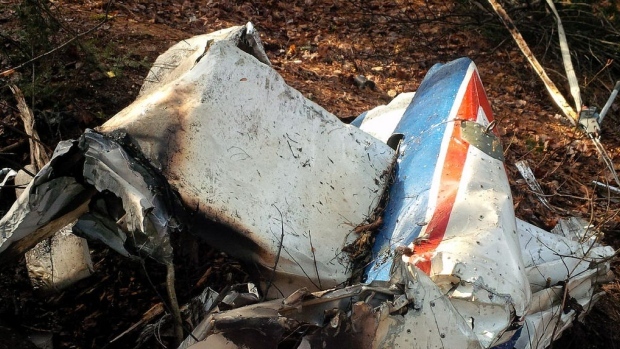 The Federal Aviation Administration is investigating the cause of the landing gear malfunction. KARIPUR: A Sharjah bound Air India plane skidded off the runway at the Karipur International Airport Monday morning. A major tragedy was averted after the plane skidded off the runway. The flight skidded off and moved on to the place where the maintenance work was on. The flight left half an hour late after bringing it back to the runway. Aviation authorities are examining whether it happened due to pilot’s negligence or due to technical problems. All the passengers and crew members are safe. 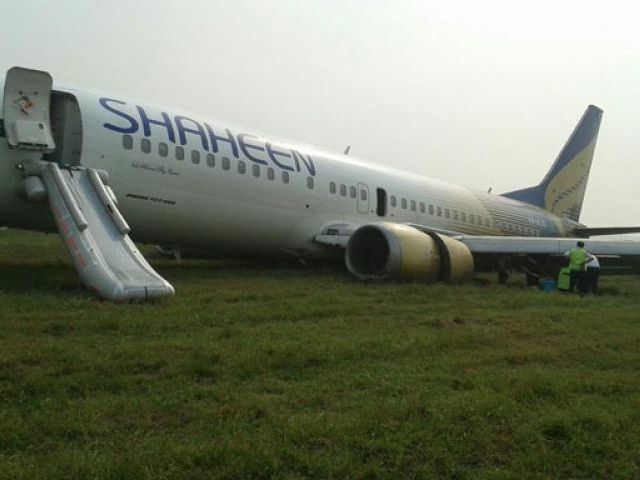 ISLAMABAD: The pilot in command of a Shaheen Air International plane that skidded off the runway in Lahore earlier this month has denied that he was intoxicated during the flight, rejecting a medical report claiming he had an unacceptable level of blood alcohol. Punjab police had arrested Captain Asmat Mehmood from his residence in Karachi last week after a medical report found he was intoxicated and fatigued during the NL-142 Karachi to Lahore flight. The Boeing 737-400 carrying more than 121 passengers was landing on November 3 when one of its tyres burst causing it to skid off the airstrip and stop about 1,000 feet short from the end into a grassy patch 70 feet west of the runway at the Allama Iqbal International Airport (AIIAP) in Lahore. Pervez George, a spokesman for the Civil Aviation Authority (CAA), said that "the medical investigation reports of cockpit crew just after the incident revealed that the pilot in command had an unacceptable level of blood alcohol" and was suffering from lack of sleep. Nobody was hurt in the accident, but the plane suffered serious damage in what could have resulted in a major disaster. But, during investigation by the Punjab police on Monday, the pilot claimed he had not consumed alcohol during the flight. Mehmood rejected the medical report in his statement, claiming that he was being framed. Mehmood said that the accident happened during landing, and that if he was drunk, it should have happened during the flight. The pilot claimed that the accident happened because the tires burst, and that he managed to land the aircraft safely despite the faulty landing gear. (WBIR-CROSSVILLE) There are small airports all across the country like Crossville Memorial Airport, but city leaders are questioning whether this one is managed as safely and efficiently as it could be. Crossville City Council member Pete Souza tried getting his peers to agree to an audit specifically to examine airport operations in October. He said security is one of his biggest concerns. "Our airport after dusk is wide open. Anybody can stop and anybody can leave," Souza said. "I have had numerous phone calls, a lot of phone calls, about activity at night at the airport and over the fact that our airport is open at night and unsupervised." Chris Bennett is the airport manager and owner of Crossville Aero, the company that operates it. He said about 10 to 15 flights use his base per day, so it's a lot different than how major airports or regional ones like Knoxville are managed. "Generally, a general aviation airport like this is uncontrolled," Bennett said. "It's not a controlled field, and it's up to the pilots to maintain safety of the passengers and aircraft." He said fences around the grounds, key pads for each gate and surveillance cameras all serve as security measures. "The only time no one's here is after dark," Bennett said. "Me and none of my staff man it after hours, and we're always on call 24 hours a day." Crossville police also keep an eye on things. "We have an officer patrolling this zone 24 hours every day," Crossville Police Chief Rodney Shoap said. But Councilman Souza isn't just raising concerns about safety. He's worried about the oversight and management of the airport's $100,000-plus annual budget. "The city enters agreement with Crossville Aero, paying it $79,000 per year to assign an airport manager that in fact oversees themselves," Souza said. "I have an issue with that." The root of the controversy dates back eight years. Audits from 2007 show the city terminated a contract with its last airport manager. It hired Bennett's company, Crossville Aero, 16 days later. Souza said the deal was a quick fix with little oversight or financial accountability. "I thought it was fiscally irresponsible to have a provision of a contract that dates back seven years where revenue was received on an honor system, whereby the contractor stated how much fuel you use and paid so much money," Souza said. He continued: "That's not to imply that the contractor was fraudulent. I thought that was irresponsible of the city to have a plan that received revenue without any authentication of the numbers." A 2008 audit shows the city council addressed previous issues and approved a new contract with Crossville Aero. Some of those issues included not establishing fuel flowage fees, not issuing requests for bids for the management position, and having some "terms of the contract appear to be much more favorable than were previously given to the former operator." But other council members said there's nothing to question at the airport. "Pete's just chasing an issue that doesn't exist," Crossville City Council member Jesse Kerley said. He said Bennett has made a lot of progress at the airport, especially when it comes to bringing business into the area. "Chris was named as our interim airport manager and then was the only individual to put a bid in the city of Crossville," Kerley said. "It's a business tool and we try to get people in here. There's a lot of people coming in here, a lot of corporate traffic," Bennett said. Souza still wants council members to take a closer look at how taxpayer dollars are being spent through a new independent audit. "We're going to have to start planning and managing for our future," Souza said. The Tennessee Comptroller of the Treasury said Crossville Memorial Airport is included in annual city audits, so it is not required to get a separate financial review. Council members will discuss Bennett's contract at a meeting next month. 10News reached out to Crossville City Manager David Rutherford, who is supposed to oversee the airport, but he would not comment on his role. With six new leisure routes in less than two years, Savannah/Hilton Head International Airport is just beginning to tap its potential for inbound growth as a destination city, the airport’s air service consultant told the airport commission at its November meeting. “While the legacy airlines continue to remain satisfied with the market, JetBlue has played a critical role in keeping fares in check,” Brad DiFiore of AilevonPacific Aviation Consulting said in his report to the board. DiFiore pointed to growth in the number of available passenger seats — which has outpaced most other airports its size – and a new emphasis on Savannah as a destination market as major factors in the airport’s resurgence. Fares have also come down, with today’s averages a far cry from just two years ago when Savannah had the dubious distinction of placing in the top five on the U.S. Department of Transportation’s list of airports with the highest fares. A quick check of direct flight fares from Savannah, Jacksonville and Charleston indicates Savannah is now cheaper to New York City’s JFK and La Guardia, Newark, Boston, Philadelphia and Charlotte. There is little doubt the turnaround started with JetBlue, said Lori Lynah, the airport’s director of marketing and air service development. “In fact, in the second quarter of last year — the first full quarter of JetBlue service – Savannah’s fares fell 13.7 percent, dropping us from the fifth most expensive of the 100 metro airports rated to the 25th most expensive,” she said. “It was a clear indication of the difference having a low-cost carrier makes, especially one as popular as JetBlue,” Lynah said. The ripple effect began months before the low-cost carrier actually arrived in February and in more than JetBlue’s announced destinations. In anticipation, Delta, United and U.S. Airways added to their Savannah service, giving passengers the weekly option of 45 more flights and 5,000 additional seats. Once JetBlue actually started service to Savannah from New York’s JFK International and Boston’s Logan International, Savannah fares began dropping as other airlines scrambled to compete. While JetBlue’s low-cost fares and popularity as a “fun-to-fly” airline gave Savannah a new dimension in air travel, the addition of Allegiant Air promoting the area as a fly-in destination was even more popular than anyone anticipated. A U.S. domestic low-cost carrier based in Las Vegas, Allegiant announced in February that it would begin spring and summer service this year to Savannah/Hilton Head from three Ohio cities — Akron/Canton, Columbus and Cincinnati. It would take almost no time for the numbers to validate Allegiant’s decision, DiFiore said. Planes were full, especially on the Cincinnati to Savannah route, prompting the airline to extend dates of service twice already. “We’re pleased to say that Ohio travelers have embraced Savannah and Hilton Head Island as a destination and are taking advantage of our low-cost, nonstop flights,” said Allegiant public relations specialist Stephanie Pilecki. 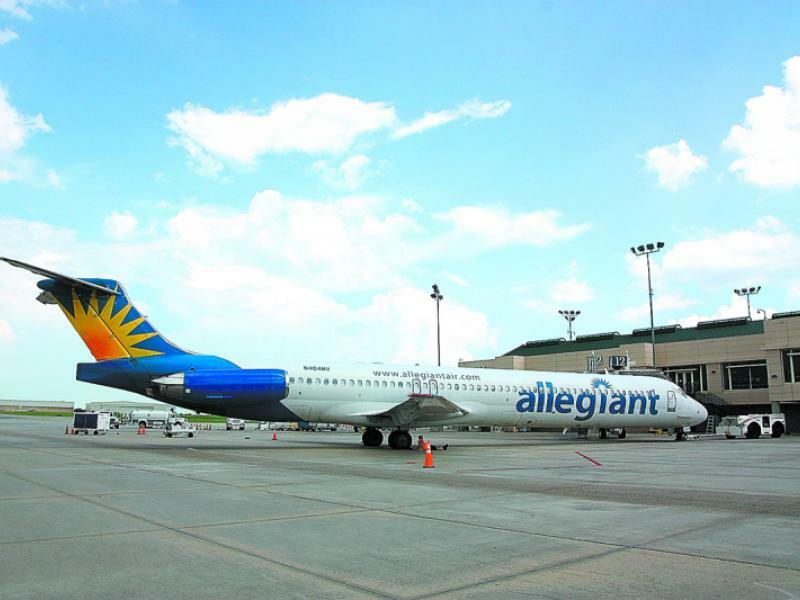 The airport is hoping for an announcement from Allegiant on new and/or expanded service to Savannah, Lynah said last week, adding that the news could come at any time. Allegiant’s success in Savannah was not lost on Sun Country Airlines, a destination carrier based in Minneapolis/St. Paul that began in late August adding seasonal nonstop service from its Twin Cities hub to Savannah. But Sun Country’s story is a bit different, DiFiore said. “We went up to Minneapolis to talk with them and learned they wanted to base an airplane somewhere in the Southeast in the fall because they do a lot of football charters down here, but everything they looked at was too expensive,” he said. DiFiore and Lynah suggested the airline consider bringing a plane down to Savannah on Thursdays, but instead of flying it empty offering it as a destination getaway for residents of the Twin Cities. “They liked the idea,” he said. “So they began flying to Savannah on Thursdays, doing their charter on Friday and Saturday and flying home on Sundays. “And a funny thing happened – they found themselves flying full or nearly full planes down here and back every weekend. 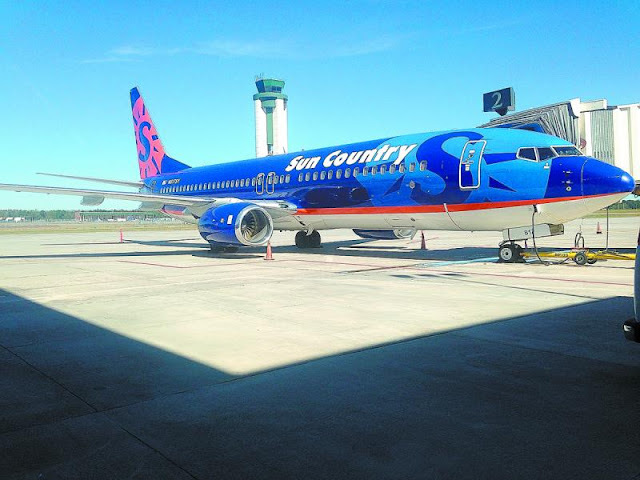 “Now, Sun Country is so confident in Savannah as a destination city, they are adding service in the spring – with no charter backstop,” DiFiore said. • Grow capacity in key existing markets. “There are a lot of people in this country who are vaguely familiar with Savannah but have never visited,” DiFiore said. “We know from experience that most people, once they visit, fall in love with the area.